Hold Still by Nina LaCour. Dutton Children's Books. 2009. 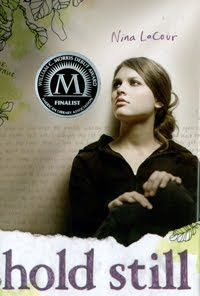 A YALSA Morris Award finalist. I picked up a review copy somewhere. The Plot: Caitlin's best friend, Ingrid, is dead. Ingrid committed suicide; and now Caitlin is left alone, to pick up the pieces, to recover from both the loss of Ingrid and with how Ingrid died. The Good: Some books you rush through, wanting to know what happens next. Some you savor the writing, so take your time. And others, like Hold Still, you pick up, read a few chapters, then stop, do something else, anything else, because it is almost unbearable. Ingrid is dead; the book starts with Caitlin finding out about it. "I watch drops of water fall from the ends of my hair. They streak down my towel, puddle on the sofa cushions. My heart pounds so hard I can feel it in my ears." Ingrid and Caitlin were best friends; the type of best friends who only needed each other's friendship during their freshman and sophomore years. Now Ingrid is gone, and Caitlin wonders how, why, could she have said something about Ingrid cutting herself? She also knows that Ingrid had been clinically depressed, and on some medication or other since she was nine. The opportunity to get inside Ingrid's head and perhaps answer the question "why" comes when Caitlin finds Ingrid's last journal. If the words left behind by Hannah in Thirteen Reasons Why are an angry shout at the world, blaming all those around her, Ingrid's words are those of a young teenager who has moments of happiness, moments of anger and hatred and love. There is no blame, not for anyone other than herself. As Caitlin looks back on her friendship with Ingrid and gains insights into both Ingrid and herself, she is also going forward, cannot really avoid it, really. Time does that. Comfort doesn't come from where she hopes -- their photography teacher is cold and dismissive to Caitlin. A new girl, Dylan, offers friendship and the start of Caitlin getting on with her life as she slowly heals and reconnects with her parents, makes new friends, even falls in love. Caitlin moves on, with loss and without regret. Ingrid, of course, breaks ones heart. Parents willing to do anything to help her, a brother who loves her, friendship, none of it can stop the sadness. Caitlin's sadness is different; it's the sadness of loss, and starting over, and being able to make the choices that Ingrid could not. Taking photographs had been something Ingrid and Caitlin shared; now Caitlin almost has to relearn to enjoy photography. To see things anew. She also ends up building a tree house in her back yard. The metaphor is obvious (rebuilding her life, building a tree house) but it's still both a pretty impressive thing to do and an amazing tree house that has six walls, windows, a seven foot ceiling. The design of Hold Still is impressive. The font of Ingrid's diary is different from the rest of the book and some of Ingrid's drawings are scattered throughout the book. The endpapers are designed as if they were part of Ingrid's journal. On the front book cover, there is the impression of a bird, just like Ingrid's journal has a wite-out bird painted on it. Caitlin's new friend, Dylan, is a lesbian. I almost didn't mention it here, because, well, the fact that Dylan has a girlfriend instead of a boyfriend really doesn't matter to Caitlin's story. Dylan becomes a good friend to Caitlin, in part because Dylan doesn't always put up with Caitlin's moods and moodswings. Oh, she's sympathetic to Caitlin's loss, but Dylan is no martyr, she's not perfect. So why do I mention it? Because I'm thinking about diversity, and when do we, as reviewers, mention it and when not? Dylan is more than a positive character who happens to be a lesbian; she's a realistic character who happens to be a lesbian. And that is important, because it's not always found in books, and it's good to point out when it is found. LOVE this book. One of my top five of 2009. Serious and wonderful. I'm finding Love, Aubrey to be one of those books as well. This sounds like a great book, but I don't know if I can make myself read anymore books that I know are going to make me cry! Thank you, I will be eager to share this with a niece; it will have very special meaning to her. Sounds really good. I just gave 13 Reasons Why to one of my students to read. It sounds as though this would be a good book for her to read next. Thanks, all! And I think I have Love Aubrey around here somewhere, I'll take a look at it. Paige, I loved 13 Reasons & understand the appeal, but I also have always read it as Hannah being as guilty as her fellow students of how she treats others & that is part of the point, for the reader to realize that one of the people who gets the tapes could be as fragile/ill as Hannah herself was; & while it's nice to start thinking in terms of how one treats others & to look outside self, I also don't think any one of those people was responsible for Hannah's actions. So, yes, HOLD STILL is, I think, a great balance to 13 REASONS WHY. I'd love to hear what your student thinks! I think the Morris Award committee has a really tough choice this year - between this one and the other choices it is going to be so hard to choose! I'm just in the middle of this right now, and you captured Caitlin and Ingrid so well in your review. I found the characters somehow more well-rounded than Wintergirls. I could see their whole personalities and interests more. Perhaps because Caitlin was not as sucked into her despair as much as the main character in Wintergirls. How would you compare these two? And I absolutely agree about the Morris Committee this year - what a hard choice! But so glad that this committee highlights new writers. I'm looking forward to reading this book--I've heard so many good things about it. Thanks for the thoughtful and well-written review.